By October 1805, Massena's French army had settled into a stalemate with his Austrian enemy, Archduke Charles. The two sides lingered on opposite banks of the Adige river, until Massena received word of Napoleon's victory at Ulm. 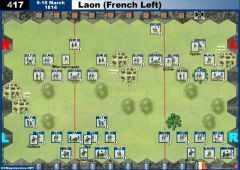 This news encouraged the French commander to order an immediate offensive, despite being outnumbered. When Archduke Charles learned of the catastrophe at Ulm, he made plans to withdraw his 50,000 men closer to Austrian soil, in case his forces would be required to defend Vienna from Napoleon. 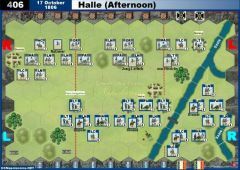 But Massena's sudden crossing of the Adige forced the Archduke to check the French advance, offering his army time and space to withdraw safely. Thus the two sides attacked each other in the thick fog of October 30, spread out across a wide hilly front. 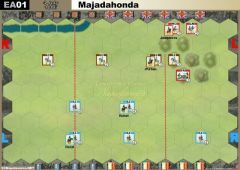 Both Massena and Archduke Charles had deployed considerable forces on the far bank of the Adige River with the hope of turning their opponent's flank. 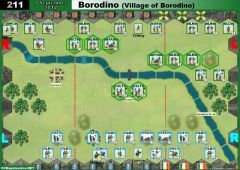 Their main armies, about 25,000 and 32,000, respectively, met along main Verona road passing through the town of Caldiero. Massena divided his army into three wings: his left wing would capture the Colognola Heights, his center would take Caldiero, and his right wing would surprise the Austrians by flanking them south of the Adige River. This ambitious plan fell apart quickly, when the Austrians struck first on both wings. 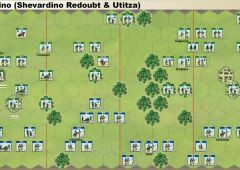 In the center, the French attack developed slowly, allowing the Austrians to shift reinforcements to assist in the defense of Caldiero. The indecisive battle ended with darkness and Archduke Charles elected to withdraw from his positions. 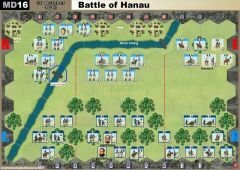 The stalemate cost both sides roughly 5,000 men. Massena then pursued Charles through Italy. 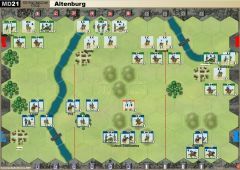 • Fog : Starting with the second Allied turn, each player rolls one die at the end of his turn, and if a Flag is rolled, the fog lifts. 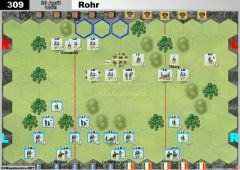 While fog is present, units may move a maximum of 1 space per turn and ranged fire is -1 die. • The town hexes are a Group Temporary Banner Objective (turn start) worth 1 victory banner for control of at least two of the three. • The Adige river is impassable. • The Ford and Bridge are a Temporary Group Banner Objective (turn start) and worth 1 victory banner to the side controlling both locations. I will report back here with the second battle result. I think you can be pleased with this scenario, I liked the added rules that made it just that little different. Thanks for the feedback! With the new expansion looming, I see I will have to go back and look at all my old releases to provide tactician numbers and make sure balance is maintained. Cant wait to hear how your next battle with this scenario goes! 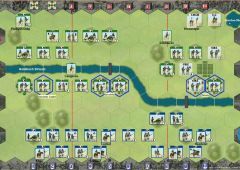 Played this scenario at our wargames club on Wednesday just gone (24/06/15) and thoroughly enjoyed it and its special rules of fog and reinforcements. 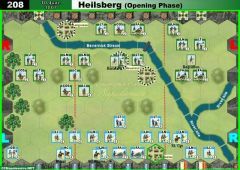 We played 5 turns where fog was laying across the battlefield and it lifted just in time for the Austrian defenders to shoot up some French infantry that were advancing under its cover. After that initial shock, the French recovered their lines and composure and began pressing the Austrian flanks. 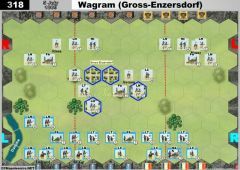 The French were soon taking the advantage and even more so as three of their cavalry units ( 1 x CUI and 2 x LC ) were unleashed on a determined assault at the Austrian centre-right position. The banner scores to this point had gone 0-2 AUS, 5-2 FRE, 5-4 FRE. Despite a late Austrian comeback on their right flank, there was too much damage to recover and the French cavalry, now supported by infantry soon finished the job for a 7-4 win (which did include a fortunate roll to remove an Austrian leader). 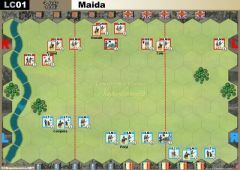 No reinforcements were called into the game, but their possibility made for an interesting decision process at times. Very much enjoyed this scenario and we will be replaying it soon by swapping sides. Clarification: cards discarded for reinforcements ARE replaced at end of turn by drawing as per usual.